While I am fortunate enough to not suffer with Celiac disease my mother does! With that said, I have been looking for gluten-free and healthier alternatives to the breads, rolls and muffins that we usually eat. After all...I think most of us could be doing a better job at watching what we personally consume and feed to our own families. Even if you have no medial problems I think you will still enjoy the Canyon Bakehouse products. Canyon Bakehouse is a company that interested me right away because they sell gluten-free breads, buns, muffins and specialty bread products. All of the products that they make & sell are made in the USA...the rocky mountains to be exact. It's always nice when we can feed our families with made in the USA products. 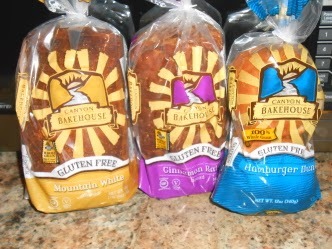 We received 3 products to try out for all of you and let me tell you up front...these are some of the best gluten-free bread products that I have ever tried! In the past, some gluten-free products have had terrible textures and bland tastes to them...this is definitely not the case with these delicious products. The Gluten-Free Cinnamon Raisin Bread was one of our favorites! We enjoy eating cinnamon raisin bread with our breakfast meal and love it toasted with some honey butter. This bread is great plain or toasted! It has a wonderful texture to it with plenty of cinnamon and raisins within it. YUMMY! The Gluten-Free Mountain White Bread is one we used for our lunchtime sandwiches. If your family is used to eating traditional white bread...this is where you will want to start with this product line. It looks like white bread & tastes like white bread. You would never know that it's gluten-free! The Gluten-Free Hamburger Buns are a really nice sized bun. You can definitely it your quarter-pound hamburgers & cheeseburgers onto these buns. One of the things we enjoyed about these buns is their taste & texture. Frankly, we now prefer these buns over the old brand that we used to purchase. Tips: You should store your Canyon Bakehouse products in the freezer (they keep for up to 3 months) and then thaw them in the refrigerator or at room temperature. They are specifically designed to be frozen which doesn't hurt their texture at all. Canyon Bakehouse 7 grain bread is DELISH!! I enjoy all of their products, especially the rosemary thyme focaccia! They are all incredible, but the hamburger buns make me feel so "normal" I could (and have...) cry! LOVE Canyon Bakehouse! They are all amazing! The hamburger buns make me feel so "normal" that I could (actually, I have...) cry! LOVE Canyon Bakehouse! I entered the Learning Resources Cash Register on TCC. 1st time I tried this bread, I never bought the other gf bread again. I order from the company every other month. My fav is Mountain White bread. Still trying to get my local grocery store to stock Canyon Bakehouse. I stressed that gf people need more than 1 brand of breads in our section too! I would like the DEli Rye Style Bread! I entered the Zest Avenue Christmas Tree giveaway on TCC. I would like to try the Deli Rye Bread and the Hamburger Rolls. I follow you on GFC (sflickinger). I entered the Chicken of the Sea to go cups giveaway on TCC. I would try the Cinnamon Raisin. I'd like to try their Deli Rye Style Bread. I entered the Art of Fitness giveaway. I love Cinnamon Raisin Bread! Would love to try theirs!